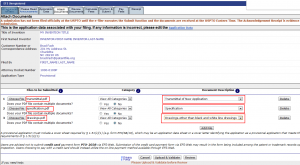 Filing a provisional patent application online - a step by step guide. At this point in the process you should have written your patent application and have three separate pdf files saved and ready to be submitted to the US Patent and Trademark Office (USPTO). If you are not ready, go back to the previous post. *Your timing must also be perfect here. If you file too early you will prematurely start your 1 year time period. 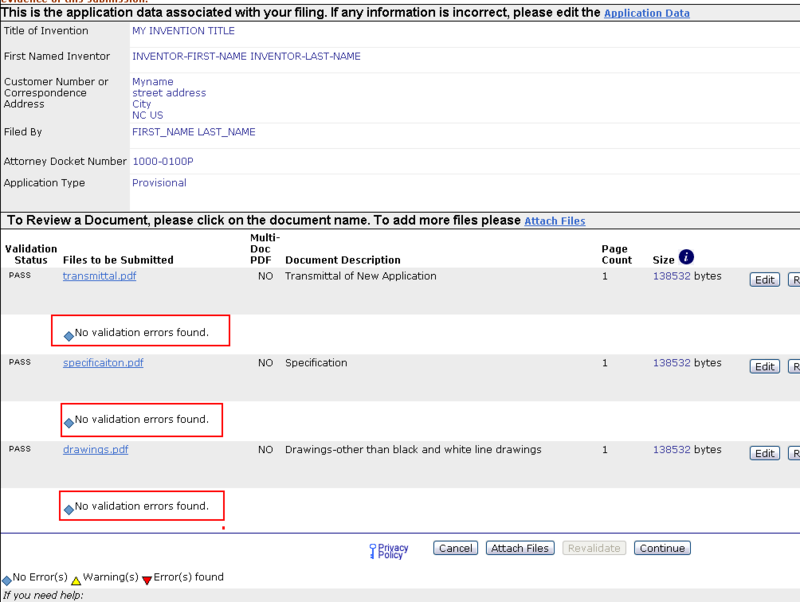 If you file too late, you could lose some patent rights. Read this post on When to File a Provisional Patent. Click on the link called "patents file online"
Step 6: One the next screen you should attach the three pdf files that you have saved and chose the proper dropdown for the Document Description section. This step might be a little tricky so hopefully the image and video will help. Click the image below to make it bigger. 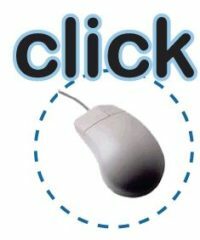 Once you are done, chose the "Upload & Validate" button. Step 7: After you press the "Upload & Validate" button, you should see this next screen showing that all 3 of your files have "No Errors" which is shown as a blue diamond symbol. If you you do get errors, make sure that the document type you are selecting is proper (see step 6) or try re-creating your pdf files using a pdf creator program like primoPDF. Step 8: If you don't have any errors, press the "Continue" button. At the next screen you will calculate your payment to the USPTO. I usually start by clicking on the "small entity" link (this assumes you are filing as an independent inventor, a small company under 500 employees, or a non-profit). 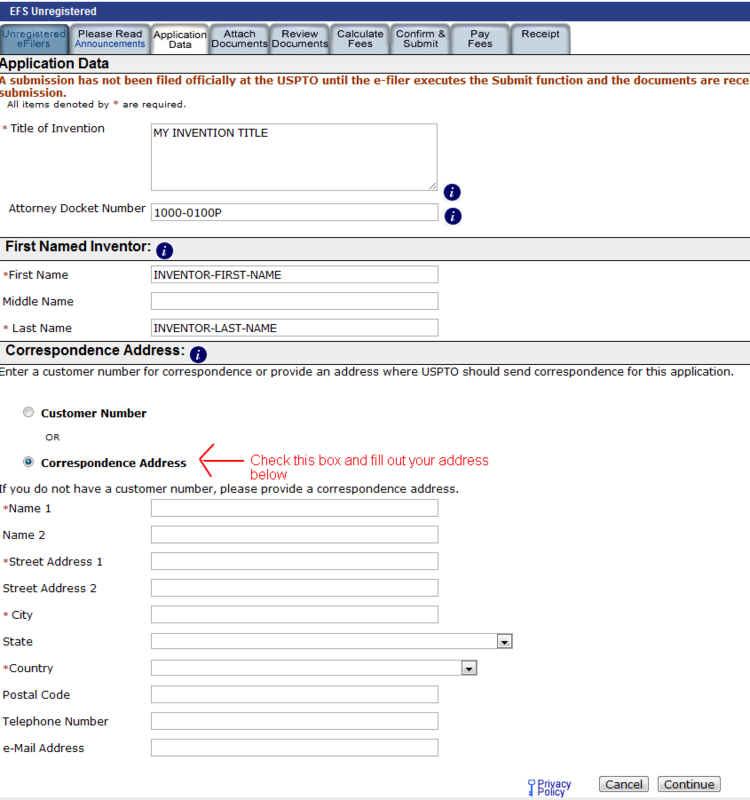 Then check the "Provisional" box and fill out the number of pages (including drawings) and press the "Calculate" button. The page should now show your total about due ($125 in my example). Then press the "Continue" button. See image below (may have to click to enlarge). Step 9: You are almost done! On the next page you want to make sure all your information is correct. Make sure all three of your pdf files are listed and click on each one to review it one last time before you file. If everything looks okay, you will hit the "Submit" button. Step 10: Don't forget to pay! You must pay the filing fee before your provisoinal patent will be considered a valid filing. I suggest you pay online with your credit card. Once you pay, make sure you print out a few copies of your electronic receipt. 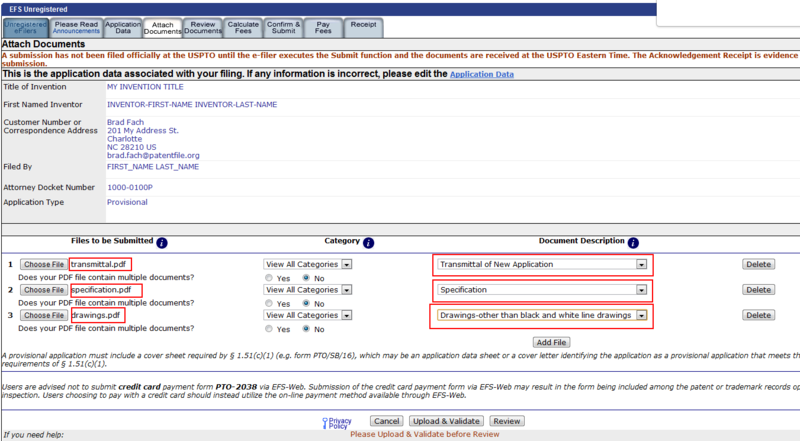 In about 3-5 weeks you will get an official filing receipt from the Patent Office. The official receipt will have your applicaiton number and filing date. You can now use the term "patent pending". Your provisional patent will expire after 12 months! 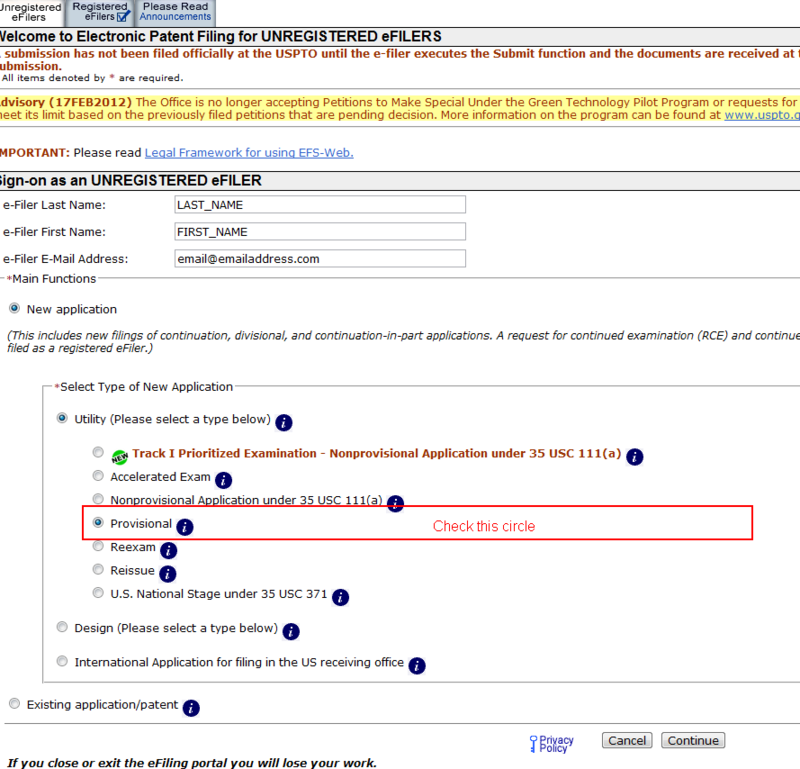 If you want to keep your patent coverage after that point, make sure to set a reminder for yourself about 10 months after you file to either re-file a new provisional patent or file a non-provisional patent. If you need help figuring out what the best strategy is, please contact me.